Whenever we hear “pop ups,” admittedly our minds still think of pop ups from the early 2000s – back when Windows had that gloomy grey color scheme and all pop ups felt like scams. Today, we’re reinventing the pop up. They don’t have to be annoying, or scam-y, and they can be a digital marketer’s best friend if you do them correctly. In fact, when done well, users really enjoy relevant pop ups. 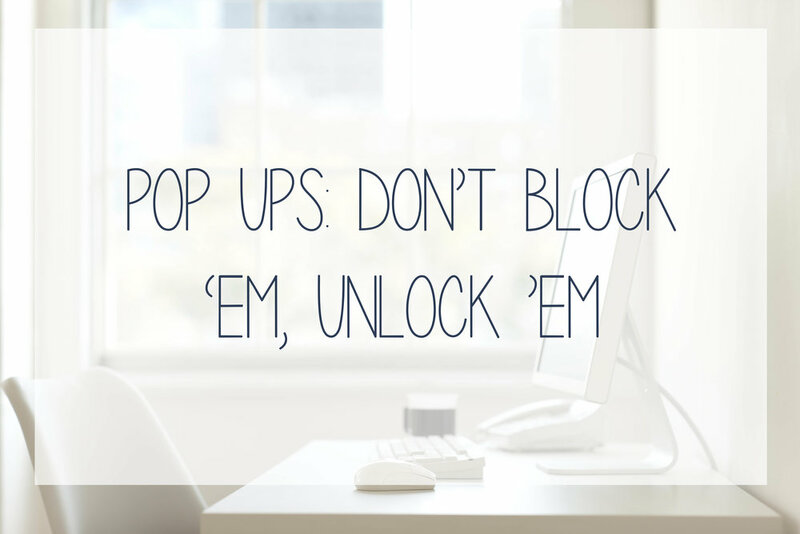 So why should you use pop ups? Well, the largest pull to use pop ups is that they are a great way to generate warm leads that actually want to consume your content. Pop ups are actually proven to drive sales, and websites that have them outperform competitors who don’t. Think about it – by signing up with their email address through your pop up, they’re saying “yes, I want to receive updates from you in my inbox,” which drives sales. When a user is presented with a pop up, they have to take action – whether that’s saying “yes, here’s my email” or by clicking out of the dialog box. So there’s a 50/50 chance they’ll give you their email address… and an even higher likelihood if you accompany your pop up with some kind of deal. Offer something. A great way to generate leads is by offering a discount, access to your blog or newsletter, or downloadable content, say… a free Ebook to whoever subscribes. Think about it in terms of your own habits – how likely are you to just give a website your email address? Probably pretty unlikely. You’d have to be offered something or be really interested to trust the website enough to give your email address away. Don’t make it look pop up-y. There are so many ways that pop ups can look like a beautiful, cohesive component of your website. Be creative and make your ads bold and bright, and make sure it looks nothing like the pop ups we all remember and loathe from the 2000’s. Don’t put too many on your site. While users may enjoy relevant pop ups, they don’t enjoy constantly having to click out of several of them while they’re surfing your site, or having the same ones pop up again and again. There are a few different kinds of pop ups. Entry Pop Ups are the ones that show up immediately when you enter a website. These are most effective if you’re a retailer, and we suggest you accompany them with a discount. Caution: an immediate pop up has the potential to deter guests from your site, so you have to be careful and offer a good deal! Timed Pop Ups pop up after a certain amount of time the user spends on the site. These are usually really effective because users have already stayed on your page for a certain length of time, so you know they’re interested in your content. Timed pop ups like “Want content like this sent to your inbox?” or “Download our free Ebook to learn even more” are usually very effective. Scroll Pop Ups occur once the user has scrolled down on your webpage or blog post a certain percentage of the page, and won’t pop up before. These are said to be the most effective type of pop up because you know that the user is interested, since they’ve already taken the time to consume your content that much! These will generate the “warmest” leads, or leads that are most likely to end up making a purchase. Here’s to reinventing pop ups! And the future of digital marketing is.. Mobile Apps! That's right - they're about to take over in the next few years and here's how you can jump on board with this trend. Remember when TVs were SO expensive? How about VCRs and Digital Cameras? In our world (business and marketing) we can easily look back just 10 - or even 5 or 2 -years ago and remember how crazy expensive websites were to build. As technology continues to evolve (at the speed of light lately - especially in this case) Apps are becoming more and more popular because they’re also becoming more affordable to build. And, the use of mobile devices - smart phones AND tablets – has continue to rise. Have you heard the expression ‘everyone carries a TV in their pocket today’? Even how we consume TV has changed and is driven more and more by…yup, you guessed it, Apps! Who here binged on the new Gilmore Girls on Netflix this weekend? Have you seen Narcos, Bluebloods, or The Crown? Do you use Verizon Fios for cable? If so, you probably downloaded the App on your phone so you can watch your favorite shows wherever you are. And it doesn’t just stop at watching video. From weather apps, to games, to loyalty cards, apps are a mobile users best friend. In fact, recent data reports that 90% of consumer’s mobile time is spend in apps. From doctor’s offices, to golf courses, to hotels, to plumbers…there’s an opportunity to build out an App! How do we know that Apps are here to stay? How about this prediction? “According to Gartner, by 2017 mobile apps will be downloaded more than 268 billion times.” And, “Non-game app downloads are estimated to grow 23% in the next five years, exceeding $182 billion in 2020.” That’s a huge amount of money and these predictions are coming to fruition at faster speeds than even anticipated with no signs of slowing at all. What are the benefits of having an App for your business? While the uses can vary, there are many universal benefits to having an app for your business. Push notifications, while small, can be a great way to connect with your consumer. Apps help you stay top of mind on a device that they’re already on all the time - without them having to stop and search for you. You’ve created a way for your customers to instantly have access to your brand, products or services in a controlled environment. While we love the internet, there is so much out there sometimes your message can get lost. However, people are selective about what they download to their mobile devices. By living on someone’s phone, you’re much more likely to cut through the clutter. On top of that, think of all the information you usually have to give to register for the apps you download. Apps can be a great way to collect emails or phone numbers to continue your marketing efforts. Committing to creating an app is one thing. Figuring out what to put in it is another. Some popular ideas include loyalty cards, business updates, sales promotions, menus, or coupons. Just to name a few. Do you own a golf course? Maybe your App creates a robust user experience by providing everything from an easy scoring system to tips on the different holes. A retail location? Keep your shoppers updated with the best place to find coupons, sales or previews of new topics. Do you write fashion blogs? Maybe your App gives out trending fashion tips and gives special discounts to boutiques you’re featuring – sounds like a win/win/win for everyone! Have a new product or service launching? Use your app to sell it! Just want to inspire? Fill your app with inspirational posts or pictures that your clients can come back to time after time. Take some time to brainstorm what will be most useful to your clients or customers to create an app experience truly customized for them. We are so very thankful, everyday. We feel grateful daily for the work that we get to do, the people that we work with – both our team and our amazing clients – for the beautiful space in which we work (at The Hive RI in the historic Mill at Lafayette) and of course for that 4 legged creature, Hubble, that keeps us happy and balanced! We have made a commitment to ourselves and to each other to only do work that makes us excited to get out of bed every day. When one of us finds ourselves not feeling that way we stop and evaluate why we are not feeling energized and excited and we re-align our focus or pivot our strategy! We are insatiable and love to learn and innovate all the time and this work that we’ve chosen, that changes constantly, certainly feeds that appetite. Our team here at Hub Digital are rockstars! Whether we’re talking about our core group or our many strategic and collaborative partners they are all smart, kind, interesting and amazingly cool people. Our clients! We realized awhile ago that our sweet spot, where we really thrive, is when we are working with people that are really great at what they do. People that know their businesses, are committed to growth and focused on doing the best they can in their chosen industry but understand the value of bringing in external support in areas where they are not the experts. We are deeply committed to working closely with our clients to build campaigns and strategies specific to their individual growth needs. What can we say here? We have a waterfall outside our door, wildlife visible through our oversized (and original) window, brick walls and ginormous ceilings, a park for walking or running in the woods (full of ponds, brooks and woods), an amazing supportive community chock full of all kinds of professionals and businesses and history all around us! We are a mile from Wickford Village and a hop, skip and a jump to the highway. Not the worst place to create fulfilling and helpful work. Many of you might not know where the ‘Hub’ in ‘Hub Digital’ comes from? Hubble, named after Robert Redford’s character in ‘The Way We Were’ NOT The Hubble Telescope as many tend to assume, is the most handsome 4 legged boss ever. He’s cute, wise beyond his 5 years, blond and has us wrapped around his cute little paws. When we’re feeling less than motivated, stressed out, or the dreaded creative block…all we have to do is take a brief ‘Hubble break’ like a walk in the woods or just snapping some pics of him to post on social media and our batteries are immediately re-charged! He’s so much more than just our logo…and often reminds us of those little things that we should always be thankful for. Wishing you and yours all the best on this, our favorite, holiday. Whether you’re with friends or family, near or far, may you be enjoying all that you have to be thankful for. Should You Outsource Your Business' Marketing? Who is in charge of marketing – creation and execution – within your business? Is it a person or a team? If it’s a single person, is that his or her sole focus, or is he or she wearing multiple hats and ‘handling marketing’ is one of them? So often, small businesses (we’re talking solopreneurs to businesses with 50+ employees) don’t understand the value of a solid marketing strategy. We’re not criticizing you here, not at all…it’s what we do and sometimes even we struggle with prioritizing our own marketing efforts! Marketing and sales go hand in hand. Yes, we know this is an age-old argument, but it’s true. Marketing compliments and supports (or at least it should!) sales, and without sales…well, all businesses need to sell, right? Some food for thought here on whether you might want to consider outsourcing some or all of your marketing. Larger companies with bigger budgets often have both internal and external (outsourced) teams, which is often optimal, but smaller companies can still experience similar benefits with an internal individual or point person and an outsourced team. Many smaller companies appoint an individual within their team who is ‘self-taught,’ and though that person may make the perfect internal point person or lead while working with an outsourced marketing company, they remain limited in their breadth and depth of experience and expertise. Let’s start with money! Having a full-time, in-house marketing expert, or team, is expensive and can cost up to 6 figures. Hiring an external digital marketing team that remains educated and at the top of their field can save you money and bring you top-notch expertise! Having access to individuals that focus solely on digital marketing and trends (which literally change on a daily basis) will often provide that extra edge over your competition. Not everyone understands, or values, the importance of staying agile and hyper focused on growth, and having an objective external team assisting with developing, executing and analyzing your growth strategies could give you the upper hand! Recruiting, hiring, training and managing internal marketing teams takes time. We don’t need to remind you that time = money! Freeing up your valuable time to focus on what you’re good at is critical to your business’ success. Staying on top of the ever-changing marketing climate is like following a rocket ship that is zigging and zagging through outer space! From the many different social platforms’ nuances, to tweaking your company’s voice and messaging specific to your audience, to analyzing your SEO and so much more…it is literally a daily commitment to stay on top. If you’re one of the lucky ones that understands the value, and is able to invest in, the constant education for an individual or team, then we high five you! Marketing companies generally charge much less than it would cost to hire one full time expert and they provide fresh, objective and comprehensive input. While we understand that many business owners may be reluctant to hire an outside team, we wanted to outline some of the many benefits! Over the past couple years, we at Hub Digital have been cultivating some relationships with other, complimentary business owners we've met in our travels (it's one of the biggest benefits of working in a co-working space!) One that I've found that has been one of the biggest benefits to both me and my clients, has been a special partnership formed with Tuni Schartner, of TRS Strategies and TS Consulting. With years of entrepreneurship under her belt, Tuni has honed the best practices for business owners and is committed to sharing those tips and tricks. Through my clients, I've found that many times, their needs extend beyond the computer. While they may come to me needing help with social media, blogging or website development, through the process they've realized they need a little something extra. As they streamline and perfect their digital presence, they find they want help with a variety of things including business strategy, integrated marketing, event planning and promotions and even grassroots marketing. Enter Tuni Schartner. Today we've asked Tuni to tell us a little bit about herself and her company and to give us the "why" behind the importance of having an integrated marketing strategy that extends beyond the digital environment. I have an authentic interest in business, social psychology and history and I truly like people so helping businesses grow is a very natural fit for me. I’m not ashamed to say that at 48 and having been an entrepreneur, or entrepreneur in training, since around age 10…I’m a little bit obsessed with what I do. I am deeply committed to education and growth myself - on a daily basis - and love to put all that I learn into practice. I refer to myself often as ‘a professional spaghetti thrower’…I am in a constant state, for my own business(es) and for my client projects, of throwing spaghetti against the wall and quantifying what is sticking, what isn’t, what to shelf, trash or invest more time, money and energy into! Business development and/or marketing - no matter what your industry - is changing at the speed of light. All the rules are in a constant state of change. Staying on top of all that change is fun for people like Amy and I. I love working with Amy/Hub Digital and find that her millennial mind and skill set coupled with her education and experience continues to be the perfect compliment to mine. Our clients are continuing to reap the rewards of our partnership and we’re continuing to develop new service offerings and programs, such as a series of ‘short’ and extremely affordable online classes that we will begin to launch (two at a time) quarterly starting in September! In order for companies to grow they really need to take a holistic, and objective, approach to looking at their business - identifying their ‘why’ (as per Simon Sinek’s TED Talk - we often know what you do, how you do it, but not ‘why’ you do it), clearly identify their differentiator(s) and unique value propositions then create short and long term growth objectives. We work closely with each client to help them work through this process, as well as clearly defining who their audience is then we create integrated marketing strategies with clear short and long term growth objectives. Now that 2016 is in full swing (well at least by 7 days), it's time to really commit to our New Year's resolutions. For many of us that means getting healthier, getting more sleep or reorganizing our finances. For those of us with businesses, we use the new year as a time to reflect on what was successful in the past year, and what we need to do a little bit better. Social media marketing tends to be the one thing that slides as we get busier. Managing our day-to-day can become so overwhelming at times, that all those extra things fall by the wayside. Our posts get fewer and far between, and our blogging becomes non-existent. Trust me, I am the ultimate perpetrator of this bad behavior. After blogging and posting all day for my clients, you can pretty much expect that I'd rather be binge watching The Real Housewives than putting stuff out on my own Facebook. Well friends, just like you, I'm starting 2016 with a new mindset and a new set of resolutions. Check them out below and hopefully they will help you get back on track in the new year. 1. Post a Minimum of 3 Times per Week - Consistency is key with social media. Posting too infrequently won't make an impact, especially with the new rules Facebook has implemented that limit your reach. To make consistent posting easier, set a recurring reminder on your calendar for 3 days per week. Make it first thing in the morning, and don't schedule any meetings or tasks until you've accomplished this. After a few weeks of practice, this will start to become second nature for you. 2. Commit to a Formula - Posting upwards of 3 times per week can seem overwhelming and you may think you may run out of content fast. Coming up with a formula can help you streamline your thoughts and keep you from spending a huge amount of time creating content. Think of it like this - Monday is a timely news article related to your business, Wednesday features your weekly blog post and Friday is something fun and light hearted. By creating a formula like this, you can easily narrow your scope and make your time more efficient. 3. Save everything that may be relevant - I can't tell you how many times I've come across a great article, picture, or quote and thought that one day I would like to post that on my Facebook. Instead of saving it or bookmarking it, I've continued on with my day, completely forgetting about that genius piece of information. Put systems in place to be able to refer back to things you find interesting. Create a bookmark folder, Google Drive or desktop folder to keep things organized and front and center. Not only will you not forget, but you'll have a stockpile of content ready to go when just want to pull out something quickly on a Monday morning. 4. Talk to your audience - There's a reason it's called "social" media. Simply pushing out information is not enough. Each day, spend some time responding to comments, thanking your loyal customers and answering questions. Go through and "like" posts that relate back to your business, and share other's relevant content on your own timeline. Getting the conversation going will engage your potential clients and get them interacting with your brand, all things that are critical in creating customers. New products and businesses are constantly flooding the internet, trying to fight over consumers and followers. With easy access to technology, every brand, business and person is jumping online to promote anything you can imagine. But are they doing it right? Make sure you know these 7 deadly sins of digital marketing so you won’t go unnoticed, or even worse, be disliked, online. 1. Setting your expectations too high - Many businesses and products fail before they even get started. You can't win a marathon by taking one step; it takes leaps and bounds to cross the finish line. Don't expect one ad or post to complete the job. Digital marketing takes creativity, dedication, and patience to build a following. 2. Being uninformed about your audience - Know your target audience, tone and message. The best message can be wasted on the wrong audience. Determine what they will and will not respond to. Throwing darts at a wall may make them stick, but you'll never get the bullseye you're looking for that way! 3. Trying to use every available outlet for recognition - Though you may have a million ideas running around, sometimes focusing on a few is the key. Out of the large number of possibilities, choose a few that coordinate the best with your product or business. Posts that need more context could be shared on Facebook, for example, rather than Twitter, which has a character limit of 140. 4. Inconsistent timeline of posting - In an age of instant gratification, the audience no longer wants to wait. Posting consistently with updates reminds the audience so they don't forget about you. DO NOT give them a chance to become impatient. This is where choosing a few valuable outlets (#3) comes in handy. Pick ones that you know you can easily update on a consistent basis. 5. Overwhelming your audience - On the flip side, don't suffocate the audience with updates. Posting too much or sending too many emails can feel like spam which leads most to block or ignore future information. Everybody has that one friend that talks your ear off over lunch, and no one likes them. Finding the happy median between lack of posts and constant information is paramount for successful digital marketing. People will also enjoy two thorough and entertaining posts rather than five poor attempts. Rely on quality over quantity. 6. Neglecting mobile users - Many users access social media and sites on their phones, iPad, or tablet. Everyone is on-the-go and wants their entertainment/information to follow suit. Don't starve certain sections of your audience. Make navigating your business convenient with a mobile site that caters to mobile users' needs. 7. Biting off more than you can chew - After all of the other advice, sometimes you just need help. Recognizing that you cannot handle everything is important and there are people ready to assist at a moment's notice. Don't be hesitant to ask for help.